Two images from the now demolished Harrison Gymnasium (Please see the post on the Harrison Gym and the Institute for more details). The coat of arms used to be with a commemorative plaque above the entrance to the stairway that took you up to the changing rooms. 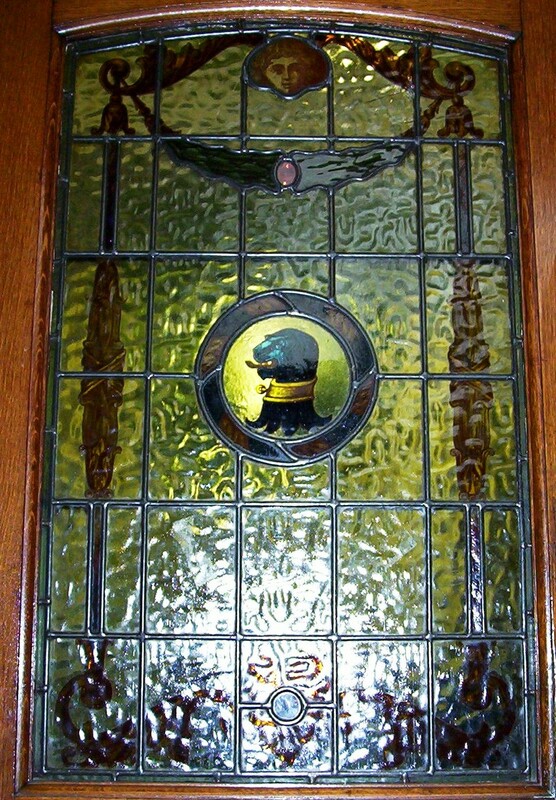 The leaded glass door was just inside the side (Charles Street) entrance to the gym, outside the boardroom. I rescued the pressed copper coat of arms just prior to the demolition team moving in, but sadly I don't know what became of the leaded glass door or the other interesting features of either the gym or the institute. I can't shed any light on the dogs head on the coat of arms, but this post prompted me to look up Joseph Harrison..Thanks for the prompt Colin. I also found an article on Cotton Town referring to his residence at Galligreaves Hall and it seemed somehow familiar,then it suddenly struck me that I knew it as the Galligreaves Pub !! I am now wondering how many other old buildings I've been in and never realised their place in Blackburns history. He moved from there to Samlesbury Hall I think. There's a chapter about it in A Blackburn Miscellany. It was Joseph's son Henry (and his wife Maud) that had the Gym and the Institute built. I've been having another look at this Coat of Arms Colin, and if you look closely both the Lion and the Dog have something similar in their mouths but I haven't a clue what it is. So after ploughing through all that Google can come up with (Zilch !!) Here is the Stoneipedia explanation to the Motto. Not Rashly but with Doggedly determination. Nice save! I'm so pleased you managed to save the coat of arms. The museum also has a portrait of Henry and a bust of his wife which - on my last visit - were archived. As you've gone into some detail with, the Harrison family spent a great deal of time and money on the town, and on Samlesbury too, which would not be in the condition it is today without the recklessly expensive restoration they carried out. Their history is tied in to much of Blackburn's history and heritage: Joseph's son Henry was at one point mayor of Blackburn. He set up the town's chamber of commerce. Much of the infirmary was paid for by the family. Further afield, the family donated money to the university of Manchester. It would be a testament to the family and town to put these on show. It would also be nice if the council had taken the same attitude towards restoration, rather than demolition. Hi - Thanks for your comment. The portrait and the bust (white marble if I recall correctly) of Mrs Harrison both used to be on display in the museum. I think they rotate their exhibits every few years and give other items in the archive an 'airing'. There used to be two portraits of Henry (prints not oils), one in the main hall of the Institute and one in the boardroom/meeting room in the Gym. Both were exactly the same and in what would appear to have been early 20th century frames. I know one was in the possession of the ex centre manager, when she moved down to the main campus of Blackburn College after the building were sold/demolished (I recall seeing it by her desk), but where the other went to, is anyone's guess. I think I may have mentioned it elsewhere on this site, but when they were looking for a name for the new railway bridge here in Blackburn, I wrote a letter to the local paper suggesting that they name it after the Harrison's as a testament to all that they had done for the town. Sadly my suggestion was ignored and they called it after Alfred Wainwright. Someone who in my opinion did very little for the town of Blackburn (he did a lot for the Lakeland fells, but apart from being born in Blackburn, I fail to see what else he contributed). There was a portrait of Joseph Harrison in the Museum and a bust of his wife.I saw it in the Social History section. Joseph bought Samlesbury Hall for his son William. 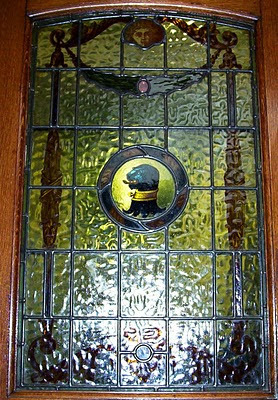 He didn't live there but his Coat of Arms is inscribed on the bottom of the staircase. He bought a mayoral chain for the town but it was stolen many years ago. I believe our mayors use Darwen's. Hello there. I'm a Harrison and a descendant. The dog's head symbolises loyalty (to the crown). The thing in its mouth is a lolling tongue. I can only say thank you for rescuing some part of my history from demolition. 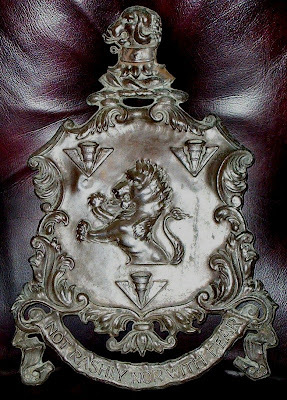 There is a coloured Harrison coat of arms above the fireplace at Salmesbury Hall, if you are interested in seeing it. Hello, I have been around Samlesbury Hall myself, on a guided tour, so have possibly seen the coat of arms you refer to, but it was more than a decade ago and I mustn't have made the connection at the time. Though I have always been aware the family owned the property at some point in its history. Other than a relatively small street named after the family and the few pieces in the museum, there's very little left as a tribute to a family who apparently did an awful lot for the town in their time. Happily when the college had a shift around a couple of years ago and they turned the Art & Design centre into an administrative block, they renamed it the Harrison Centre. We have recently purchased a 1837 Book case which came from the Samlesbury Hall.It has the crest carved into the base at each end along with the initials WJH also carved into the panels. We would love some more detail on the Harrison family and also the history behind the case and it crest. VERY TEMPERAMENTAL IS THE LAST COMMENTS APP. IF SOMETIMES THERE ARE NO COMMENTS IN THE COLUMN, CALL BACK IN A DAY OR TWO AND IT WILL PROBABLY HAVE RECTIFIED ITSELF. ANY COMMENTS LEFT, WILL ALWAYS APPEAR UNDER THE POSTING THOUGH (ONCE THEY'VE BEEN MODERATED OF COURSE - USUALLY HAPPENS WITHIN 24 HRS). To view a recent comment, clicking on the comment after the word WROTE will take you to that particular comment under the posting it refers to. Then just scroll up to view earlier comments under the same image. Clicking on the posting's title, just below the comment, will take you to the picture at the top of the post (then just scroll down to view any comments). IF ON A POSTING THE IMAGE ISN'T THERE, THEN JUST CLICK ON THE SMALL SQUARE (SOMETIMES HAS A RED X IN IT) AND THE IMAGE SHOULD APPEAR. IT'S A TECHNICAL FAULT, BEYOND MY CONTROL. PLEASE ALSO CHECK OUT MY FACEBOOK PAGE (LOG IN TO THE FACEBOOK SITE AND TYPE BLACKBURN PAST IN THE SEARCH). INTERESTED IN BLACKBURN TRANSPORT (BUSES & TRAMS) ? THEN PLEASE CHECK OUT THE LINK BELOW. YOU WILL HAVE TO COPY & PASTE IT INTO YOUR BROWSER (SORRY), AS I CAN NO LONGER ADD LINKS DIRECTLY TO THIS COLUMN, FOR SOME REASON. THIS BLOG WILL CONSIST OF OLD IMAGES AND PHOTOGRAPHS, IN THE MAIN, BUT OTHER ASPECTS OF 'OLD' BLACKBURN MAY SNEAK ON FROM TIME TO TIME (ie, interesting artefacts and interesting Blackburn folk - Well, pictures of them anyway). I DON'T HAVE PAGE NUMBERS. SO AT THE BOTTOM OF THE PAGE, PLEASE ENSURE YOU CLICK THE Older Posts BUTTON, TO SEE THE NEXT PAGE. OR LOOK UNDER 'Labels' AND CLICK ON WHATEVER TAKES YOUR INTEREST. IT IS GOING TO BE PRETTY SELF INDULGENT, LOTS OF MY FAVOURITE IMAGES ALL IN ONE PLACE, BUT IF YOU WOULD LIKE TO COMMENT, FEEL FREE. TO LEAVE A COMMENT, CLICK ON 'COMMENTS' BELOW THE RELEVANT IMAGE/POST, CHOOSE 'GOOGLE ACCOUNT' FROM THE DROP DOWN OPTIONS AND CREATE AN ACCOUNT (TAKES JUST 2 MINUTES TO DO) OR CHOOSE 'ANONYMOUS' AND INCLUDE YOUR NAME IN YOUR COMMENT. OFFENSIVE LANGUAGE IS NOT ACCEPTABLE, SO IF YOUR COMMENT INCLUDES CERTAIN WORDS IT WILL NOT BE PUBLISHED. I HAVE NO MEANS OF EDITING ANYTHING LEFT BY OTHERS, I CAN ONLY PUBLISH IN THE ENTIRETY OR DELETE. SO IT IS IN YOUR OWN INTERESTS NOT TO SWEAR.